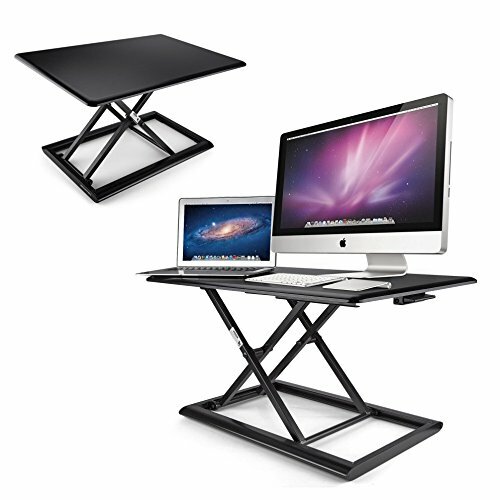 Do you want to have a instantly adjustable laptop desk stand that gives you relief of back or should pain from sitting too long? Are you looking for a small height-adjustable standing desk that can fit your small office desk but capable of taking heavy load? Do you want to have a quick solution for addressing your health concern from sitting all day long during stressful working hours? Are you looking for an aesthetically pleasing monitor riser for your employees so that it matches your office atmosphere and decor in great harmony? Do you want your desktop computer desk to adjust for personalized height for various users and increase productivity & energy? Are you hoping to set up a standing desk at office that only requires one-man job and can be carried into office easily by yourself? This rock solid stand-up desk that comes in both black and white can serve you all of the needs above and will surprise you with much more functions than expected. Its 30" x 20" footprint occupies much less space and real estate than those gigantic large standing desks and makes sit-to-stand immediately accessible in your limited work space at office or home. Smaller in size, but its quality and weight can easily accommodate a dual screen setup or other heavy load up to 40 lb. Nowadays we sit much longer for work than anytime in history due to development of technology and computers. As we have little time for everyday exercise, why not choose this sit-stand workstation for a constant stretch during work.